BOOK your place for storytime sessions aboard a ferry, in the City's parks or a community garden as Liverpool joins in a national celebration of reading. "Anytime is Storytime", part of the the national Read On. Get On. campaign takes place on Monday, 10 August 1015 when stories will be read aloud at seven locations across the City. The storytelling is aimed at Under 5's with the whole family invited to come and enjoy the sessions together. Liverpool City Council is fully supporting Anytime is Storytime and councillors will be joining storytellers from City of Readers and Beanstalk who will be offering both group and 1 to 1 reading sessions, encouraging families to bring along a blanket, get comfy and relax with some quality reading time. The community garden is in the Greenbank ward where Councillors are encouraging reading as a priority. 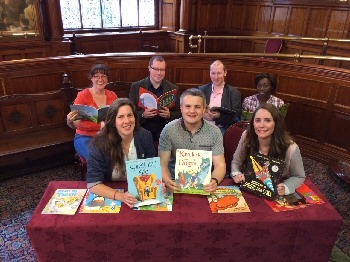 Councillor Jay Roberts said:- "We have chosen literacy as 1 of the ward priorities and are delighted to participate in the City's 'Anytime is Storytime' event on 10 August 2015. As a ward councillor I have made monthly free books available to all children under 5 in our ward over the past 2 years, part funded by the international Dolly Parton Imagination Library scheme"
Councillor Orr added:- "Anytime is Storytime, is a really imaginative way of getting young children interested in reading. They will be able to hear stories with their families in different locations and I am sure it will encourage them to want to hear more and get them interested in books." Other locations staging storytime sessions are the Isla Gladstone Conservatory, Stanley Park and Croxteth Hall and there will also be activities taking place at Liverpool Central Station and Liverpool Central Library throughout the day . The Storytime events will be taking place from 12pm to 3pm. Group storytelling sessions will take place at 12pm, 1pm and 2pm with ongoing family storytelling sessions throughout the day. The Reader Organisation will also be hosting a special version of their weekly Tiny Reads session from 10am to 11.00am at Calderstones Mansion House in Calderstones Park. This will be an hour of picture books, crafts, rhymes and songs to entertain the little ones and start them on their reading journey. The events are free although there is a charge for adults and children over 5 on the ferry.